GRAFTON: Josephine “Jo” Bouthillette died Monday, December 25th, 2017 in Worcester. She was 85. 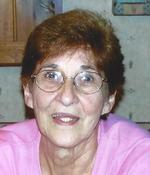 Jo was born on November 1, 1932 in Worcester, MA, daughter of James and Elizabeth Pane. She married the love of her life, Louis Bouthillette, in 1952 and was in love with him until the day she died. She and Louie had three children that she adored: Ann Marie, Louis “Butchie” Jr., and David. A graduate of Girls’ Trade in Worcester, Jo was an expert at quilting and sewing, and made quilts for her whole family that have been used and deeply loved over the years. Jo, a longtime Grafton resident, went on to work at the Grafton Public School System and Brigham Hill Nursing Home, as well as Wyman-Gordon, from which she retired. She also worked at Buggy Whip Caterers in Grafton for many years. She volunteered at the bereavement committee at St. Mary’s Parish as well. She devoted her days to spending time with those she loved, always giving her whole heart and spending time with her children and grandchildren, going to the Grafton Senior Center and out to eat with friends, and going to her cherished coffee shop, Donut Star. Jo was an amazing woman with a big heart who was devoted to her grandchildren, always there when anyone needed her, and always wanted to make sure she gave her guests a good meal, as she was an amazing cook. Her values were rooted in family and she loved to share stories of the past about her childhood, her Italian heritage of which she was very proud, and her family and friends. Jo is predeceased by her husband of 42 years, Louie Bouthillette, and her sister, Dorothy Robinson. She is survived by her daughter, Ann Marie and her husband, Scott Thomas of Northbridge, her son Louis and his wife, Denise of North Carolina, and her son, David and his wife, Jodie of Northbridge, her two sisters, Patricia Sills and Delores (June) Perrone, her eight grandchildren: Nicole, Jim, Chris, Anthony, Brianna, Joe, Leah, and Alicia, and her two great-grandchildren, Abbey and Jack. She positively impacted everyone she knew with her humor and kindness. She will be dearly missed. “See you later, alligator.” Crocodile, Nana.